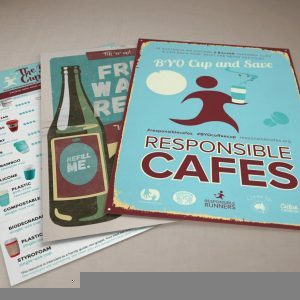 Responsible Cafes runs as a community not for profit group. All donations received through the sale of these items will go directly back into growing the initiative, offering support for Cafes, Councils, Keen Beans and all waste warriors. Over the years we have had many requests to send out poster kits but we sadly don’t have the resources to do so. After lots of feedback from our cafe community we have created this “Cafe Starter Kit’ so you can promote your involvement. What is in your kit? Tired of getting drips of coffee in the bottom of your bag? Got a cupboard full of unwanted jars you can’t bring yourself to throw away? We have a solution!! 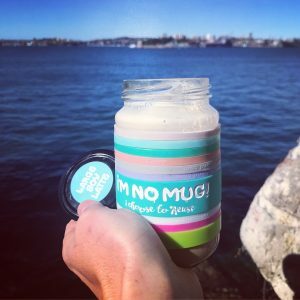 Grab yourself a kit to upcycle your unwanted jars into your very own, unique reusable cup. Keen to get your customers, students, friends and family upcycling their unwanted jars? 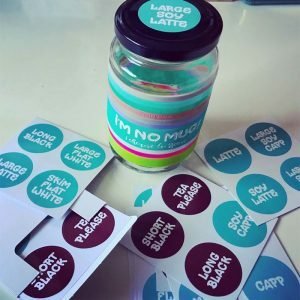 Stock up on our “I’M NO MUG, I CHOOSE TO REUSE” silicone bands. Please note items are distributed every 2 weeks to reduce our fulfilment costs and to keep the costs as low for you as possible. You will receive an email notification once your order has been distributed.